Piazza del Plebiscito is one of the largest squares in Italy! There are so many things to do in Naples that us locals love, but aren’t as popular among the tourists. Maybe because they don’t know about them, or because they just have one day in Naples before to move to the Amalfi Coast, to visit Capri or somewhere else during your trip to Italy. 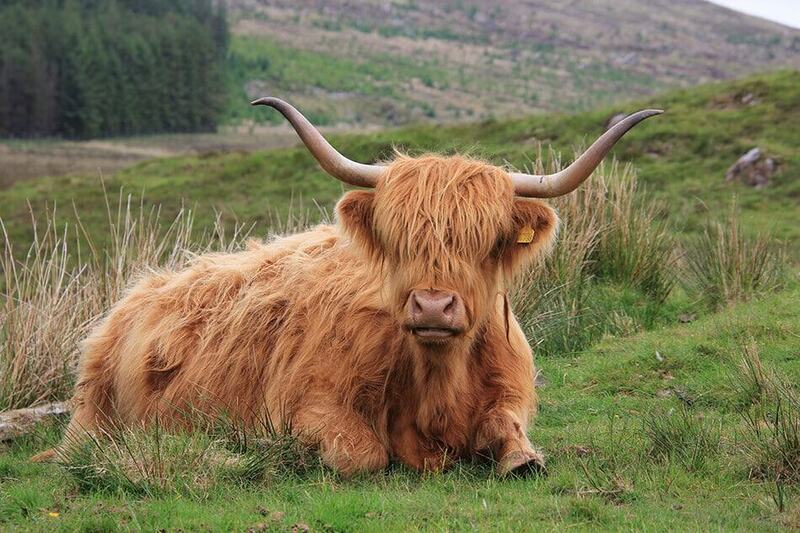 But some of them are among the most beautiful things you could ever see in our Country so it’d be a pity to miss them! The list of Naples must see spots is pretty long so I divided it into macro sections. 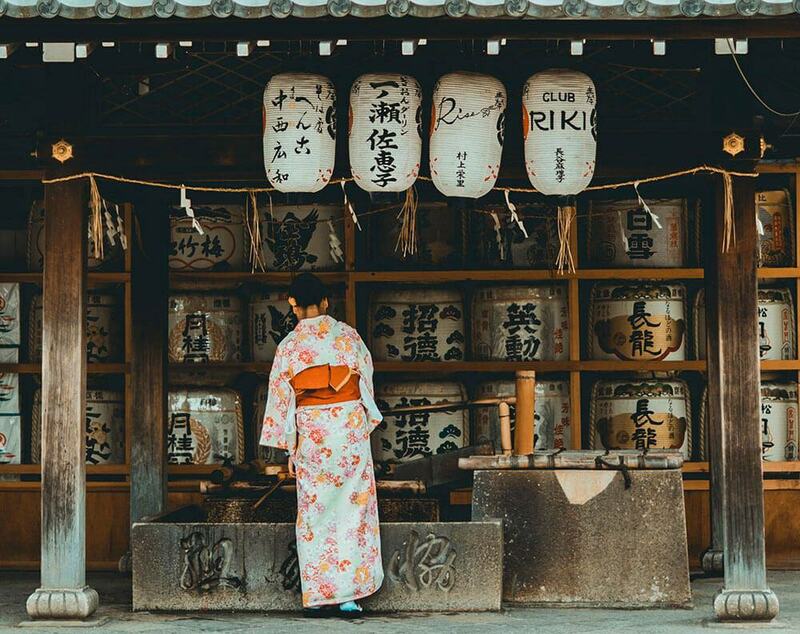 Hopefully it’ll be easier to just check out all the places you want to add to your bucket list! As usual, if you’re planning to visit Naples, always make sure you have a clear itinerary! With this list you can tailor the perfect one to explore Naples your own way! 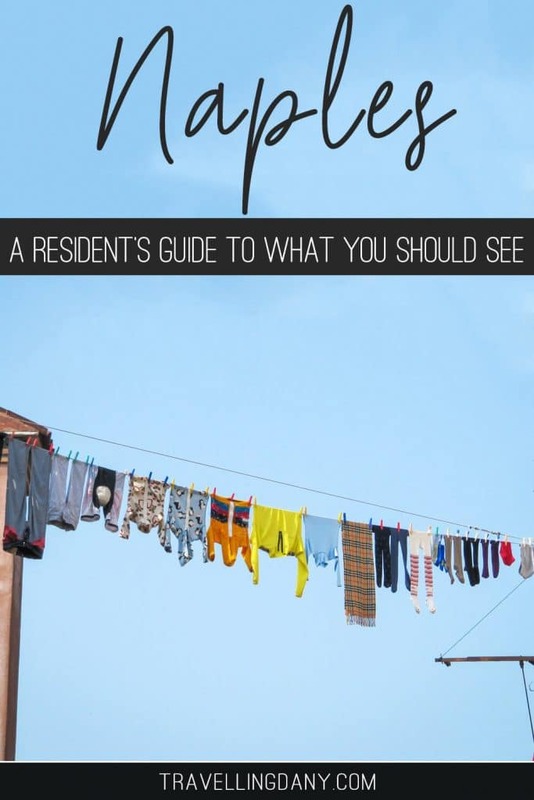 Naples can be pretty warm: be aware of what to wear in Italy in summer when packing! Naples is a mix of sacred and profane. Our city is very Catholic, and very much superstitious, to the point that there are still a lot of everyday “rituals” (you probably say “knock on wood“, in Napoli we are all about “tocca ferro” (knock on… iron) and take it very seriously!) that are part of our culture. Yet while exploring the city you will find so many amazing Churches and religious buildings: more often than not you can enter for free so absolutely go have a look! The only thing you have to remember is that you have to have your legs and shoulders covered. Yes, even in Summer! One of my favorite Churches in Naples is the Duomo, Naples Cathedral. Located in the ancient part of the city, it’s also widely known as Cattedrale di San Gennaro, in honour of Saint Januarius, Naples’ patron saint. You can enter for free, but be prepared for the magnificence of a Church that dates back to the XIVth century: it even includes a reliquary and a crypt. At the Duomo di Napoli, twice a year, on the first Saturday in May and on September 19, the Archbishop of Naples brings out a vial of the “blood of San Gennaro”. Usually on these two days every year the dried blood liquefies (we call it “Miracolo di San Gennaro“). Should it not happen, the legend states that a disaster will befall Naples: here we usually think that Mount Vesuvius will wake up from its sleep. San Gennaro is in fact very much loved in Naples because it is believed that he stopped the Vesuvius, saving our city. Beware: if you visit on these two days, there will be huge crowds! Another one of Naples must see is the Tesoro di San Gennaro, located inside the Duomo. Tickets cost 8€ per person and include a guided tour of the Duomo, the Real Cappella del Tesoro (the Royal Chapel of the treasure, embellished with precious marbles, frescoes and statues), and the treasure itself. This exhibition is unique and breathtaking: you will be able to see masterpieces in gold and precious gemstones, including the most important silver collection in the world. There’s no need to book tickets in advance, unless you decide to visit during the “miracle day“! Yet another must see in Naples is the Basilica di San Domenico Maggiore, a Gothic, Roman Catholic church and monastery founded by the friars of the Dominican Order, located in a square with the same name in the old part of Napoli, the Centro Storico that is a UNESCO World Heritage site. You can visit the church for free. A few years ago you could’ve seen Caravaggio or Tiziano paintings here. Now they have moved all the most beautiful paintings into the Museum of San Domenico Maggiore. You can access it from the Church. Tickets cost 5€ per person for a 30 minutes visit, from 10am to 6pm every day. Basilica di Santa Chiara is always at the top of many lists of things to do in Naples (Italy). This religious complex in fact includes a Church, a monastery, tombs and an archeological museum! It’s located in Via Benedetto Croce, which is the easternmost leg of Via Spaccanapoli (keep reading for more info). You might have seen its brightly colored majolica also on a few Lonely Planet guides on Italy: they’re definitely one of the highlights of this complex. It’s definitely one of the most instagrammable spots in Naples, but please, remember that, while the majolica are absolutely amazing, you’re still visiting a religious building so behave appropriately. If you have enough time, visit the cannon terrace at Castel dell’Ovo: you won’t need a ticket! Among the things to see in Naples, castles and historical buildings play an essential role. 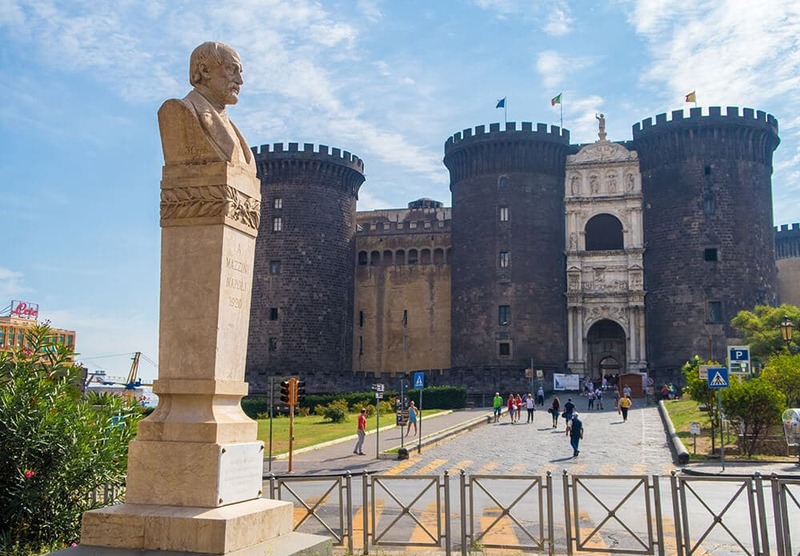 As soon as you approach the port of Naples, in fact, you will be faced with the Castel Nuovo, also known as Maschio Angioino. This medieval castle guards the Naples port and welcomes the cruise passengers disembarking to explore our city. While the only part of the castle you can visit for free is the courtyard, there’s a small museum inside. Tickets cost 6€ but to be honest, unless they have a specific exhibit you want to see, I’d avoid it. Take pictures of this amazing castle and move on, towards the nearby Royal Palace of Naples. From Piazza del Plebiscito you can take pictures of the statues of the kings of Naples for free. If you want to visit the Royal Palace, tickets cost 6€ (unless there’s a temporary exhibit) and you will be treated to the amazing main marble staircase, to the small Teatrino di Corte (recently restored), to a visit of the royal chambers. 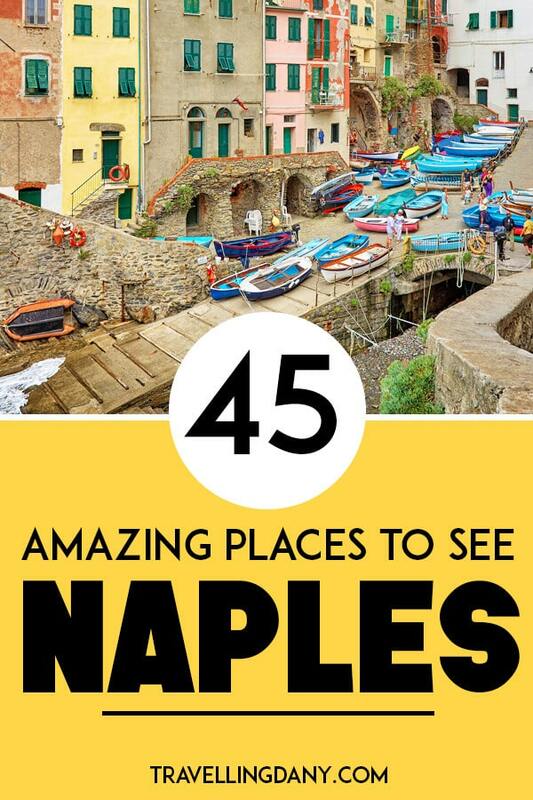 If you have time, absolutely add it to your itinerary because it’s one of the top things to do in Naples (Italy). Next to the Royal Palace you will find the absolutely amazing San Carlo Theatre. They do have guided tours with tickets at 9€. The tours last 40 minutes and you will have to buy an extra ticket if you want to visit the MeMUS (Multimedia Museum of Teatro San Carlo). If you don’t have much time and you’re still trying to decide what to do in Naples, this area is full of wonders. In fact, on the opposite side to San Carlo Theatre you will find the Galleria Umberto I, filled with shops, ancient cafes and… my favorite snack spot. I already told you about Sfogliatelle Mery, it’s the place where you can buy some of the most delicious foods in Naples: sfogliatelle, babà and even tiny caprese cakes (a chocolate cake with almonds and powdered sugar). Because the prices are still very low if compared to other shops in Naples, stop by and enjoy your sfogliatella while visiting Galleria Umberto I! If you want to stop for an espresso, I suggest one of the most famous Naples cafe: Grand Cafe Gambrinus. Castel dell’Ovo is a castle located on a tiny island, Megaride. You can access the stone bridge that lets you walk to the castle from Santa Lucia, one of the most beautiful areas to find lodging in Naples. According to the legend, the poet Virgil, who was believed to be a sorcerer, hid a magical egg in the foundations while building this “yellow” castle. Had the egg been broken, the castle would’ve been destroyed and with it, also the whole city. This is the reason behind the name “Egg castle“. You can enter for free: while there isn’t much to see (this castle was almost completely destroyed several times), the view from the cannons terrace is absolutely amazing. At its feet there’s Borgo Marinari, a little fishermen’s village, which is one of the most romantic places in Naples. In case you visit in the evening, there are quite a few candle-lit restaurants that you can go to, but you should definitely book in advance. Here you can find a handy guide to tipping in Italy, with Italian sentences that you can use! Not enough? 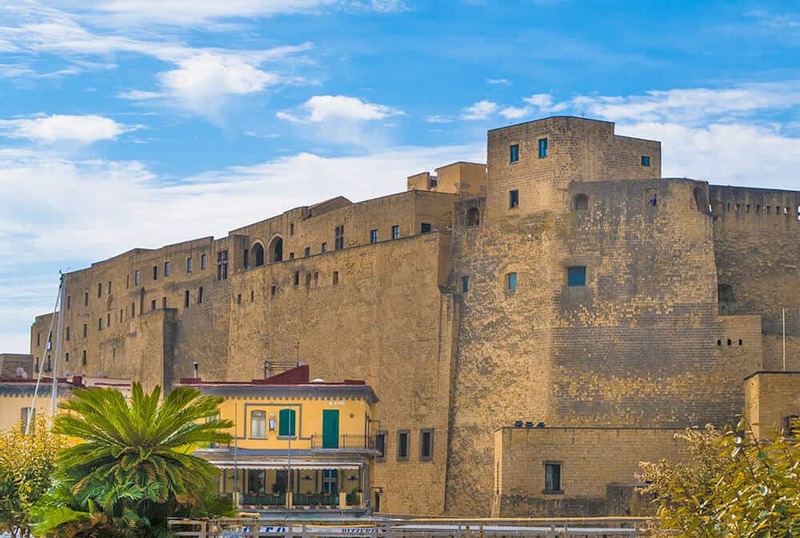 Another must see in Naples, if you decide to go for a longer visit, is Castel Sant’Elmo. This medieval fortress is located on a hilltop near the Certosa di San Martino. Inside the castle there are several permanent art exhibits and up to a few years ago they even held a large Comicon like the Lucca Comics and Games (Naples Comicon): cosplayers could dress up as knights and re-enact their favorite scenes from movies, role play games or tv-series inside a real castle! The Certosa di San Martino dominates Naples: here you can see how much! The Certosa di San Martino (Charterhouse of St. Martin) is a former monastery, now a museum, overlooking the city from the Vomero hill. Tickets will cost you 6€ per person and let you visit the ancient Church, gardens with a fabulous view on Naples and the Vesuvius, an ancient “presepe” (a big nativity set), a courtyard with amazing carriages and a naval section. Palazzo San Giacomo is our town hall in Naples. You can’t be wrong: from the port of Naples, keep waking straight ahead, after the Maschio Angioino you will see a square with the amazing Fontana del Nettuno. The neoclassical building at its back is Palazzo San Giacomo. Unfortunately it’s not always open for visits (because there are offices where people are actually working), but this area has been recently restored and it’s absolutely beautiful so it’s worth a trip. From here you can also walk to Galleria Umberto I, Piazza del Plebiscito and Via Toledo! Two of the most amazing Naples attractions that tourists don’t know anything about are Villa Pignatelli and Villa Rosebery. Villa Pignatelli is a beautiful palace that has been turned into an amazing museum. While you walk through the amazing rooms, it feels like stepping into another era. Here you can also visit the gardens and the courtyard with the carriages. A ticket costs 5€ and they are open every day from 8:30am to 5pm (last entrance at 4pm). Unfortunately Villa Rosebery, which is even more beautiful than Villa Pignatelli, is only open a couple of times every year: this is in fact one of the three official residences of the President of the Italian Republic. The view from its gardens is stunning! Naples is a cultural hub in Italy. Not only because of the many historical buildings and castles, but because there are quite a few museums in the top 10 things to do in Naples: there’s something for everyone! If you like history, then by all means, head over to the Museo Archeologico di Napoli (National Archaeological Museum, Naples). It is considered one of the most important museums in the world when it comes to Roman history. Located in the Centro Storico (the old part of Naples), it also has an impressive Egyptian collection, considered the third biggest one in the world after the Egyptian Museum of Cairo and the Egyptian Museum of Turin (Italy). Tickets cost 12€ and if you are planning to visit you should consider a bare minimum of 3 hours to see everything. One of my very favorite, and an absolute Naples must see (please, go visit and you won’t believe your eyes!) is Cappella Sansevero. This chapel is located near the church of San Domenico Maggiore, a few steps away from Via San Gregorio Armeno, our Christmas Alley. The legend states that the Sansevero prince was a sorcerer and that he was able to turn people into marble statues. People were terrified of him, but this was the only way they knew how to describe what we all believe to be one of the most beautiful work of art of all times. The Cristo Velato (Veiled Christ) is a marble statue that shows a dead Christ, laid on a couch and covered with a thin veil which adheres perfectly to his form. This work of art by Giuseppe Sammartino, is so realistic that even Antonio Canova said he would willingly give up ten years of his own life to produce a similar masterpiece. In this area you can buy taralli napoletani, a delicious souvenir from Italy! Cappella Sansevero is located in the narrow vicoli and most tourists don’t go there because they don’t know the amazing treasures hidden in this tiny chapel. Not only the Veiled Christ but also a few other sculptures that are so detailed that you could think they are alive. In the basement there are also two “anatomical machines“, a male and a pregnant woman. These are two skeletons encased in hardened arteries and veins, colored in red and blue. Upon seeing them, people thought that the Prince had turned his pregnant wife and her lover into two monsters: even today it’s unclear what technique was used to create the two anatomical machines. Tickets for Cappella Sansevero cost 7€ and unfortunately inside you aren’t allowed to take pictures or videos. 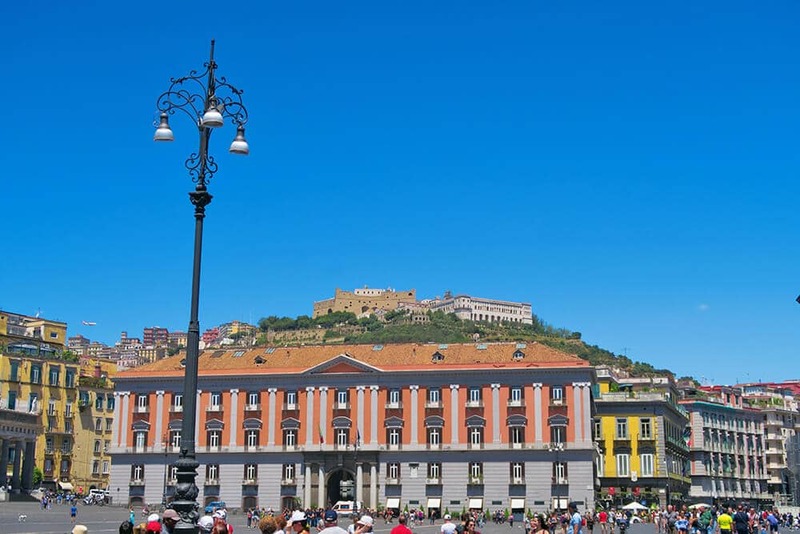 Piazza Municipio in Naples has been recently restored and is worth the trip: gelato anyone? Are you a fan of sciences and astronomy? 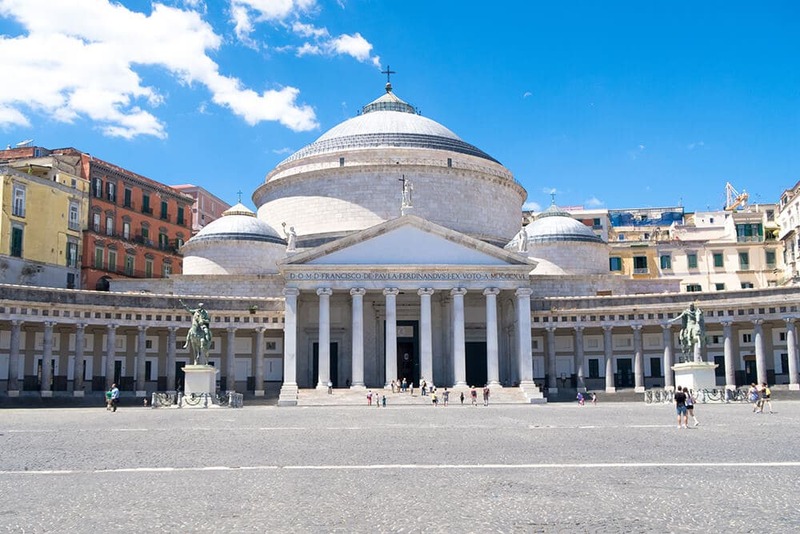 Then add the Osservatorio astronomico di Capodimonte (Capodimonte Observatory) and the Museo Universitario delle scienze e delle arti (University Museum of arts and sciences) to your list of things to do in Naples. The first one is, of course, an Observatory. In the evening they often hold interesting sessions where you can watch the stars while listening to jazz music. The Museum is mostly an Anatomy museum divided into several sections: anatomy, pharmacology, art and stomatology. One of the lesser known museums in Naples (also to the locals) is the Museo di Pietrarsa (National Railway Museum of Pietrarsa). 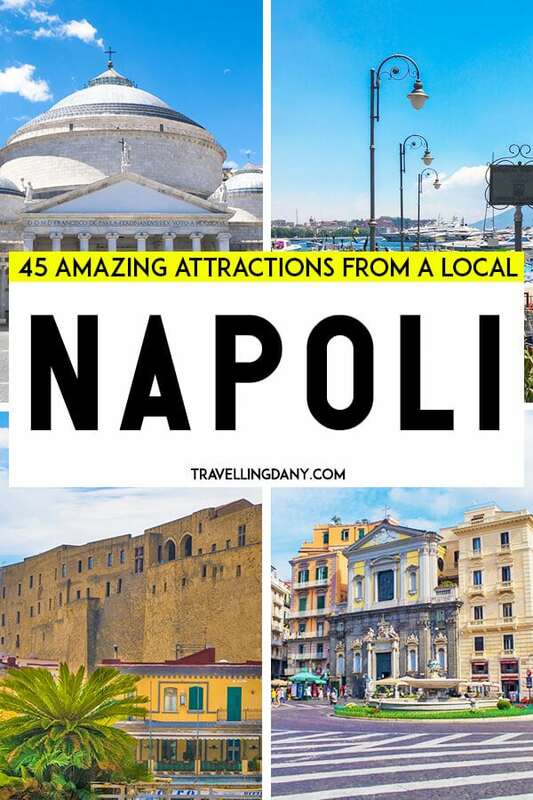 It mixes Naples history with its railways and it’s one of the favorites from families with kids who visit Naples because they can explore vintage carriages and historical trains. The guided tour lasts about one hour and costs 5€. Those who love art won’t be disappointed either. Three of our best art museums are among the most popular Naples attractions. The Museo Nazionale di Capodimonte is located in the ancient Capodimonte palace. Here you will be able to see a gorgeous collection of paintings (Raffaello, Tiziano, Parmigianino, Caravaggio, and many more), an important collection of modern paintings (included the Vesuvius by Andy Warhol) and the royal apartments. Tickets cost 12€. 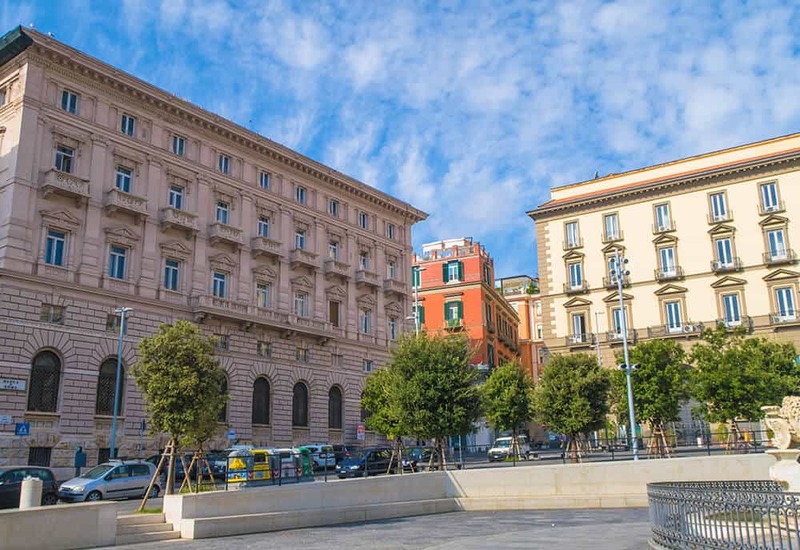 Another important arts museum is PAN (Palazzo delle arti di Napoli), which is free to visit, allowing everyone to access art and creativity, through paintings, sculptures, photography, cinema, video art and even cartoons. There are always new events, always free of charge. Last but not least, the Museo d’Arte Contemporanea Donnaregina – M.A.D.R.E. (Donnaregina Contemporary Art Museum), which has a permanent collection and a few events that often bring in town bizarre and unique forms of art. Tickets cost 8€. The Mazzini statue in front of the Maschio Angioino: visit the courtyard for free! If you could check the list of things to do in Naples of the millions of tourists that visit every year you’d be baffled. Mostly all of them look the same. 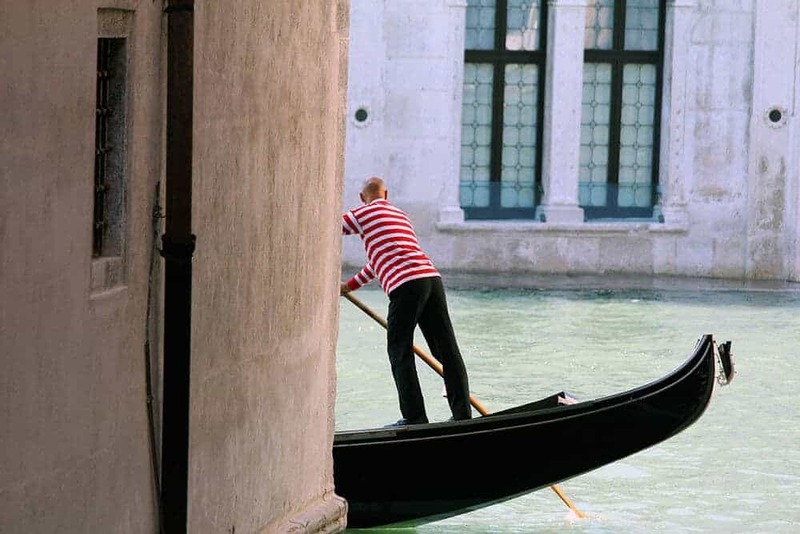 Of course there’s pizza, a few monuments, sea, sfogliatelle and maybe a couple of museums. But if you’re interested in visiting Naples out of the beaten path, you’re in the right place. 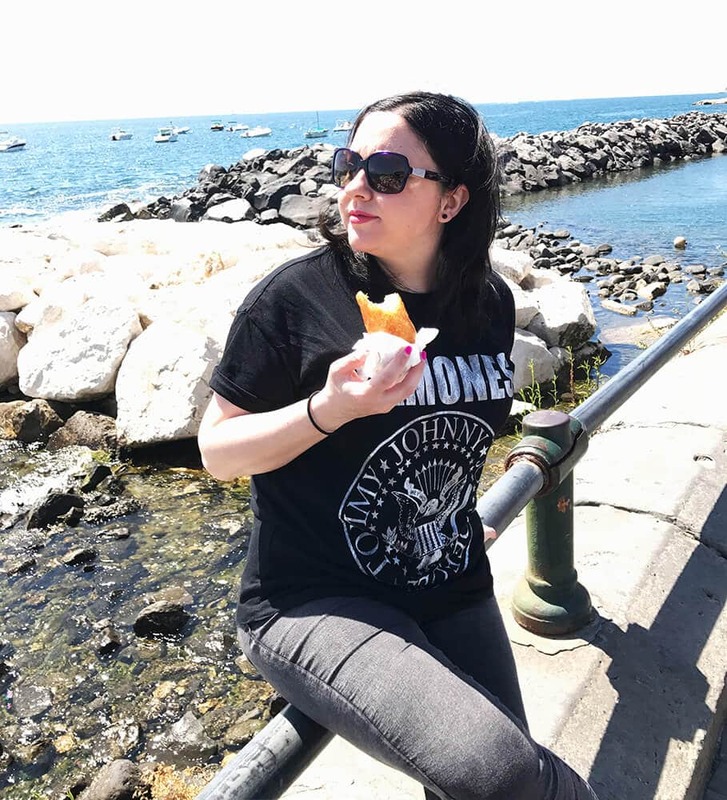 I love to explore the unusual, quirky and interesting spots that not many people know about, and having studied Naples history at university has helped a lot! One of the spots can be a bit macabre: if you are afraid of seeing human skulls and bones, don’t visit the Cimitero delle Fontanelle (Fontanelle Cemetery) in Naples! This ancient ossuary is located in the Materdei area and back in the day there was a cult of devotion to these skulls (up to the XXth century), so much so that the Cardinal Ursi of Naples decided that it was pagan and unhealthy, so this ossuary was closed. It has recently undergone restoration and can now be visited. People in Naples used to believe that by “adopting” one of the skulls (these used to be bodies of the poor, most of them don’t even have a name), by bringing them flowers and little presents, they would be kind to them. The “Capuzzelle” (skulls in Neapolitan dialect) were a token of the souls of poor people, so “anime pezzentelle” (“poor souls” in Neapolitan dialect). They were to bring health, happiness, love and money, to those who were kind enough to remember about them. The entrance is free, but it’s also a good idea to visit with a Neapolitan guide that can tell you all about the legends. Some of the skulls have quite interesting ones! Another unusual but absolutely amazing experience you can try is visiting Naples Underground – Napoli Sotterranea. Underneath the city in fact there are many tunnels, a Greek-Roman aqueduct, the remains of a Roman Theater, and a War Museum. In these tunnels in fact people from Naples used to hide from the bombings during World War II and they left behind a lot of interesting objects. Naples Underground is located in the Centro Storico, and you can access it from Via dei Tribunali. They also have tours in English. Tickets cost 10€. Another place you can go to, if you want to see what Naples is hiding, is the Catacombe di San Gennaro. These ancient catacombs are remains of Roman tombs (including the San Gennaro tomb). They are an unusual and interesting part of Naples, but to get there you will have to climb down a hundred steps (that you will then have to climb up to come out). Yet, there are ramps and escalators for the disabled, because Naples is trying to become a more accessible city. Here we firmly believe that art and culture are for everyone to enjoy! Another Naples must do (if you like the out of the beaten path experiences) is exploring the Bourbon tunnel under the city. Their official website has very detailed info on how to walk to the entrance. This tunnel will require you to climb down a XVIIIth century staircase, to get under Naples and explore a Renaissance aqueduct system, admiring bridges built by the Bourbon to bypass the cisterns. There’s also a World War II shelter, with objects that look like they’re just out of a time capsule, vintage cars and motorbikes found buried under tons of debris. For the adventurous ones they also have a tour (it costs 15€) so you will do some rafting under the city: it is a bit scary and you are required to wear a helmet and use a torch, but absolutely worth the trip! A great and unusual way to explore Naples is by using the Art Metro stations on Line 1. With your regular metro ticket you can go from station to station: they are free art and history museums that everyone can explore. Also make sure to visit the Toledo Station in Naples: it’s considered the most beautiful metro station in Europe! One of our favorite activities on Lungomare Caracciolo? Well of course eating babà! Some of the fun things you can do in Naples are definitely around Via Toledo, a few steps away from Piazza del Plebiscito. Via Toledo is absolutely amazing, especially when it’s all decorated for Christmas. 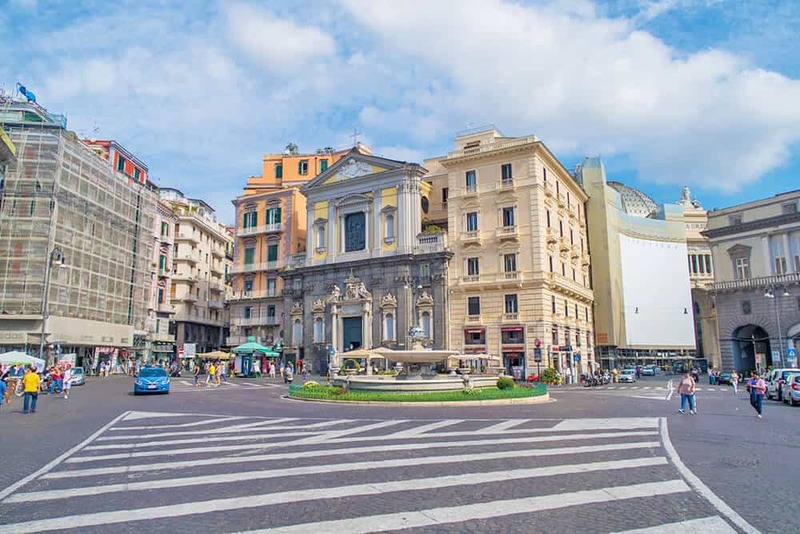 It’s also a great place for shopping, as you will find arts and crafts, the famous chocolate shop Gay Odin, old shops and new ones in an unusual mix that you’ll only see in Naples. Walk across Piazza del Plebiscito, while taking pictures of the Royal Palace and of all the statues, and keep going towards Santa Lucia and the sea. On Lungomare Caracciolo you can tan, grab an Italian gelato, eat pizza or stroll through our Villa Comunale (our public park). Looking for some cheap food and the “real” Naples? Head over to Spaccanapoli, an ancient street that crosses the Centro Storico, with many historical buildings, tiny little shops and places where you can eat a delicious “pizza a portafoglio” for 1.50€. Here you will also find Via San Gregorio Armeno, where it’s always Christmas, every day of the year! If you visit Naples in winter, especially during the Christmas holidays, finding lodging might be difficult so make sure you book well in advance. 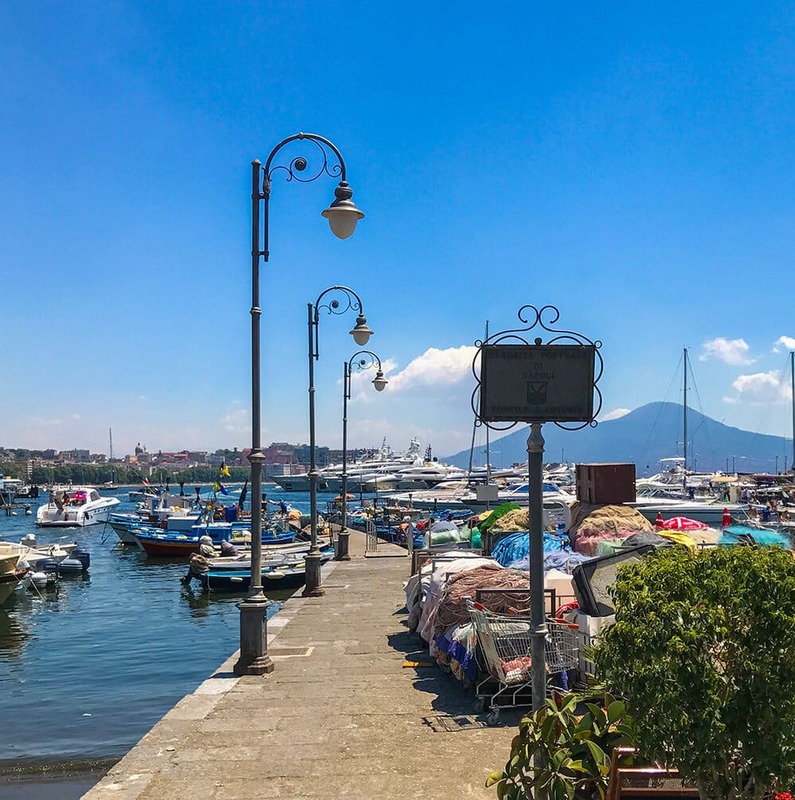 If you are looking for the perfect instagrammable spot in Naples, take a bus to the Posillipo Hill, from where you can take pictures of the whole city with the Vesuvius in the background. The area is very quiet and full of green spots. All the lovely public parks in Naples are absolutely breathtaking when the flowers are blooming. So add one of them to your spring bucket list for Italy! If you’re looking for those picture perfect spots you’ve seen often enough on Instagram, there are quite a few of them in Naples and in the surrounding area. Even if you don’t get to visit Capri or tour the Amalfi Coast, you can still find interesting green spots in the city. 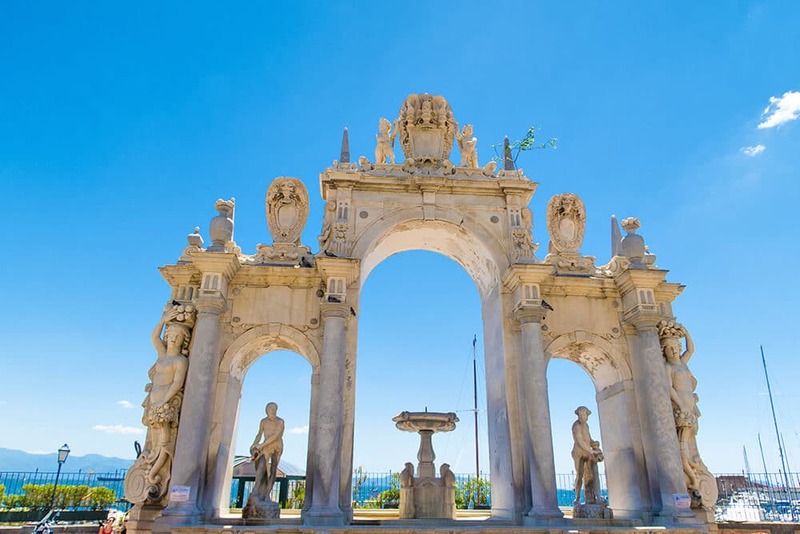 One, probably the biggest and most beautiful park, is Parco Virgiliano, located on the Posillipo Hill. Recently restored, it’s pretty big and you can enter for free through a monumental gate on Viale Virgilio. This park has many beautiful terraces from where you can take pictures of the Gulf of Naples, of Procida, Ischia and Capri islands and even Capo Miseno and Mount Vesuvius! There are also areas where the kids can play and many rose bushes. 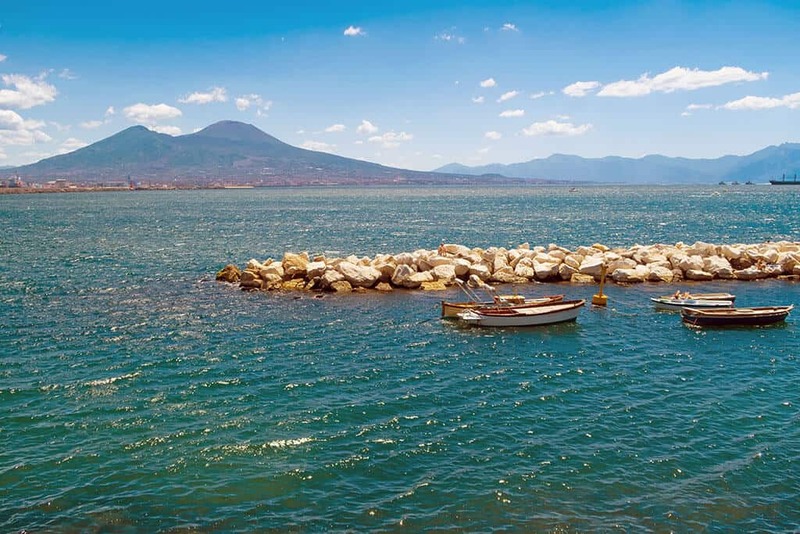 Not too far from Parco Virgiliano there are two of the most beautiful and almost unspoiled areas in Naples: The Gaiola Underwater Park and the Pausilypon archeological site. Here you can also visit Marechiaro, a romantic little port where you can take pictures with the traditional fishermen boats. If you like to explore gardens, add the Orto Botanico (Botanical garden) to your list of things to see in Naples. It was founded in the 19th century when the city was dominated by the French and it’s one of the most amazing in Naples, full of the flowers, trees and plants you can find in our region. As you probably already know, volcanoes are a big thing here. You can decide to hike on Mount Vesuvius to reach its crater, or to visit the Pompeii archaeological site. But consider also visiting a regional park that it’s pretty popular among Italians and yet it’s usually completely forgotten by the tourists from abroad. The Parco Regionale dei Campi Flegrei is an active volcanic area in the heart of Campania region. This park protects the area. Think of a (much smaller) Yellowstone in Italy! Beware: you can’t visit wearing your flip flops! Longer trip to Naples? Plan a day trip to the Amalfi Coast to get a tan!